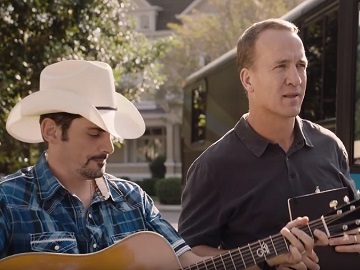 Nationwide continues its “Jingle Sessions” campaign with a new ad starring Peyton Manning and Brad Paisley. The spot features Paisley and the former football quarterback, who took on the title of Paisley’s jingle coach a while back, searching for songwriting inspiration. As they look at a couple and a Nationwide agent discussing in front of their house, they overhear the latter telling them how they could save up to 20% by bundling their home and auto insurance with Nationwide. “Bundling home and auto, two songs in one,” Manning says excitedly, asking Paisley if they’re called “crossover”. Informed that this is more a “mash-up,” Manning agrees and reminds his fellow why they’re a great band. When Paisley answers they’re not a band before turning around and leaving, the football legend counters that they are. Manning, who became a Nationwide spokesman in 2014, and Paisley, who became the voice of the Nationwide insurance jingle in 2016, have co-starred in several other spots included in The Jingle Sessions.